Anime Limited to release “Sword of the Stranger”. Coming to Blu-ray and DVD in 2017. If our catalogue is anything to go by, we at Anime Limited we love having the opportunity to bring films to the United Kingdom and Ireland. Be them lesser known works, new films and even established classics. Today we’re delighted to announce we will be bringing the classic Sword of the Stranger to Blu-ray and DVD in 2017. Directed by Mashiro Ando (Snow White with the Red Hair, Under The Dog, Blast of Tempest) and animation from Studio BONES (Fullmetal Alchemist Brotherhood, Eureka Seven, Cowboy Bebop: The Movie, Wolf’s Rain) comes a films that focuses on a nameless samurai (“Nanashi”) and the boy he vows to protect from pursuing feudal factions. 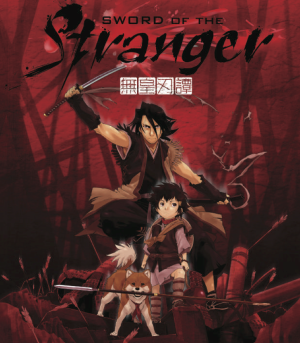 Synopsis: “Hunted by the Mings from China, young Kotaro and his dog meet a nameless samurai (“Nanashi”) who is constantly being haunted by dreams of the past which lead him to seal his sword. Among the Mings is a fiercesome Western fighter named Rarou, who desires only to find a worthy opponent. We can confirm there will be a Collector’s Edition style release that will include both the English language audio and original Japanese with subtitles. We will have more details on what to expect from our release in the coming months – we are currently in the approvals phase of our release, so until we have that 100% confirmed we’re unable to comment on what will be included. Sword of the Stranger has been released in the United Kingdom by Beez Entertainment in the past, but that release has long since been out-of-print. We are very excited to be able to bring this film back to the United Kingdom so fans can watch it. It will be well worth the wait!